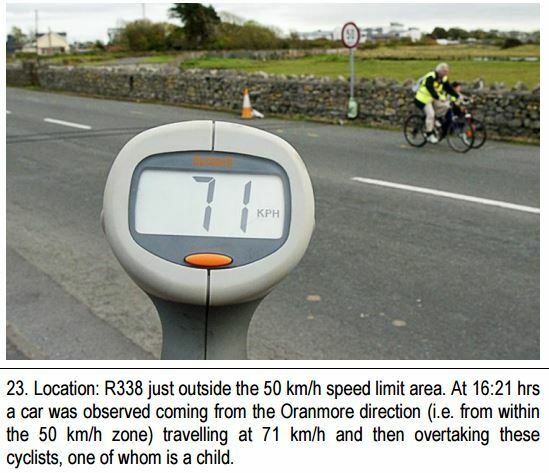 COMMENT & ANALYSIS: Back in February we reported how Cosain, a Galway-based road safety campaign group, objected to a Garda Chief Superintendent wanting to give penalty points to people who did not wear high-vis jackets while walking and cycling on public roads and streets. However, local reporter isn’t happy with Cosain’s stance. Dara Bradley, a reporter and columnist with the Galway City Tribune, on Friday make a rather personal attack on Cosain’s PRO, Simon Comer. With a fairly sickening headline — “Cosain’s death wish?” — Bradley says that for “some reason” Cosain had an issue with what Garda Chief Superintendent Tom Curley had said. For some reason (to borrow a phrase), Bradley fails to mention that Chief Superintendent Curley had proposed fining people for walking or cycling without high-vis. Not a single country in the world fines people for not wearing high-vis on city streets and roads, but Bradley was fine with including that suggestion in his report on the Galway City joint policing committee, as if it was hardly noteworthy. Does his position tell a lot about the prevailing from the windscreen view in Galway? It might do. Galway has a relatively high cycling modal share (for cycling in an area away from Dublin), but its streets and planning are very much so motoring-focused and there’s little signs of that changing. Cork and Limerick are trying to accommodate cycling, but it’s hard to count Galway in that. Councillors in Galway even fought against some key public bike sharing stations. Bradley isn’t interest in research, he says “Cosain can quote all the research they want” — Bradley knows the facts and the fact apparently is that high-vis will make people more visible and that will save everybody. High-vis isn’t a solution because high-vis can’t solve inattentional blindness (which we’ve written about in detail here), or motorists overtaking other road users without giving them enough space, or motorists pulling out in front of people cycling. What about people cycling in the dark? There’s these things called bicycle lights and it’s already illegal to cycle in the dark without them. It’s more of a problem that some people who cycle see cheap high-vis as an alternative to even half-decent lights which are far more effective and proven. 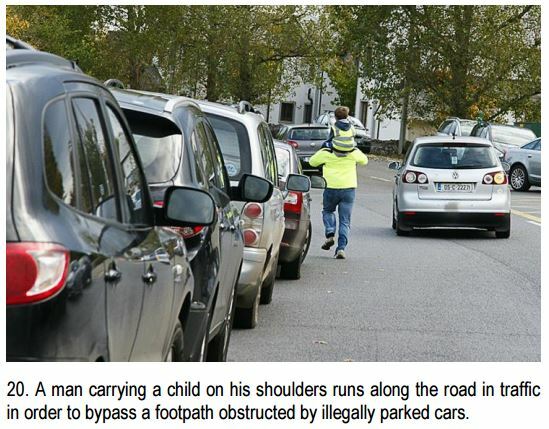 Chief Superintendent Curley might be well advised to enforce current laws for bicycles and car before trying to dream up new ones. The truth is that high-vis has failed. It’s promotion has failed and it will never be made mandatory for walking and cycling everywhere. The suggestion of making it mandatory is daftness — you might as well try to make it mandatory for all clothes to include high-vis elements. It’s never going to happen. Bradley ends by saying: “What will they tell us next – that wearing life-jackets won’t diminish your risk of drowning?” It shows that he is blind to or is in denial of the main problem: Poor driving. The life jacket analogy would only work if he thought that life-jackets save people from shark attacks… maybe he does? Pointing cyclists who do not wear high vis.? How much more anti-cycling can you get? Since when do clothes determine if a driver is paying attention or not? Well done Cian with this riposte directed at all who think hi-vis decking-out of potential victims of road violence (yes that’s what it is – violence) is a solution to the real and present hazard which is inattention of drivers to the real safety needs of cyclists and a failure by An Garda to understand that dangerous overtaking is a constant threat from drivers with drivers passing us far too close and FAST! We need a paradigm-shift in traffic management regime from roads authorities, the Garda and the DoTTAS and its agencies like the RSA, NTA and NRA. Motorised free-flow is still the name of the game. Until the ‘from the windscreen view’ of our roads changes then nothing will happen. For that transofmation to happen all senior officials amd ministers need to be out and about on their bikes in traffic. Experiential learning works wonders. But they don’t have the balls or the inclination to do so. It’s not hard to agree with Cherokee S and Mike McKillen. The establishment hi-viz fetish is a convenient way of avoiding the truth. Careless dangerous driving is going unchecked completely above the law. Meanwhile victim blaming of pedestrians and cyclists is the classic avoidance distraction tactic used by our cowardly authorities. Complete betrayal of people’s rights to use the nations road, streets and footpaths. Why should the most dangerous mode of travel for everyone else not enclosed in it be exempt ? He’s a journalist. Today that means no research because, “Bradley isn’t interest in research, he says “Cosain can quote all the research they want” — Bradley knows the facts and…”. Worshippers from the windscreen won’t have their cannon upset by facts and will cling to their fetish to the bitter end ( of a vulnerable road user) ? Excellent point about bridge, we have a local one here, hit on a daily basis and bears testament to many close scrapes despite pre warning and hi viz signs. 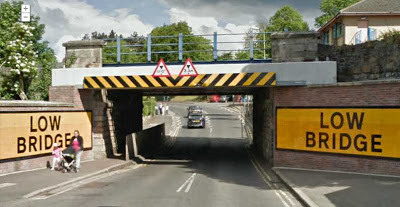 Separating tall traffic from low traffic and not allowing any tall traffic on a now protected low traffic only lane would eliminate impact with the top of the bridge and would allow for the removal of the scratched and scraped hi viz signage.